In the following steps we’ll be implementing a custom tokenizer and finally an analyzer using the tokenizer. As final result we want to be able to create multiple tokens from an input string by splitting it by the character “e” and case-insensitive and in addition the character “e” should not be part of the tokens created. To create a tokenizer to fit the scenario above is easy for us as there already exists the CharTokenizer that our custom tokenizer class may inherit. We just need to implement one method that gets the codepoint value of the parsed character as parameter and returns whether it matches the character “e” . Older Lucene Versions: Since Lucene 3.1 the CharTokenizer API has changed, in older versions we’re using isTokenChar(char c) instead. Now that we’ve got a simple tokenizer we’d like to add an analyzer using our tokenizer and making our analysis case-insensitive. 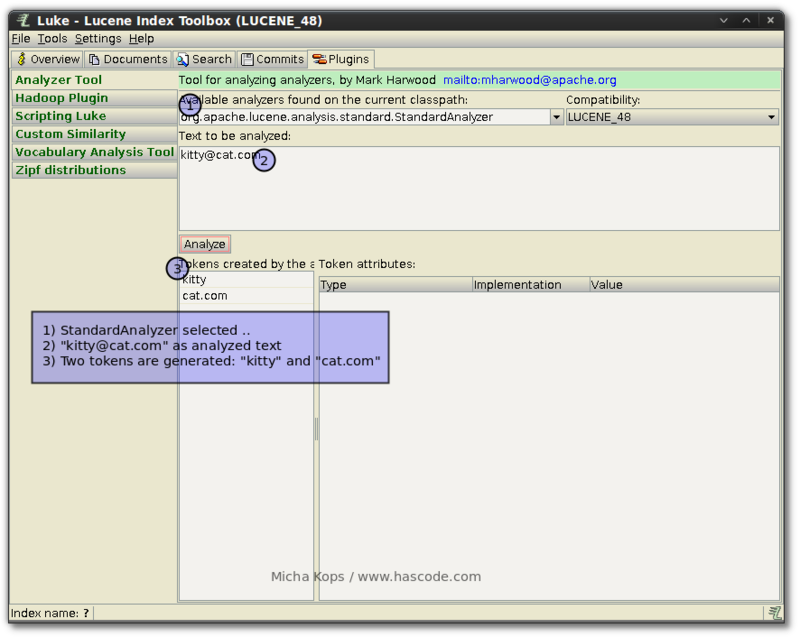 If we wanted to test our components built now there is a tool for this: Luke – the Lucene Index Toolbox. For further details about this topic, please feel free to skip to the appendix. 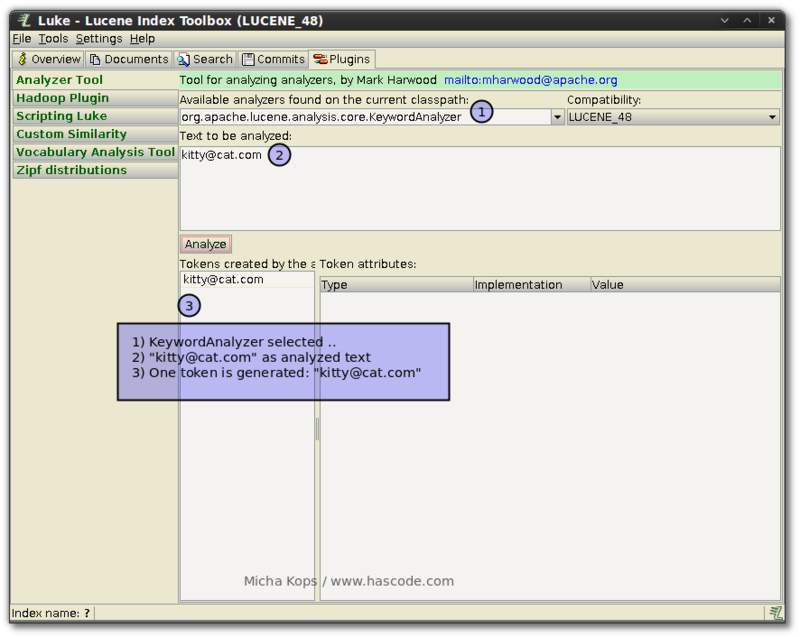 An analyzer is used when input is stored in the index and when input is processed in a search query. Lucene’s PerFieldAnalyzerWrapper allows us to specify an analyzer for each field name and a default analyzer as a fallback. In the following example, we’re assigning two analyzers to the fields named “somefield” and “someotherfield” and the StandardAnalyzer is used as a default for every other field not specified in the mapping. Finally we’re ready to put everything together adding our custom analyzer and using a per-field-analyzer. .. TermQuery for “kitty@cat.com” in the field “email” matched because the KeywordAnalyzer, not the StandardAnalyzer has been applied (why? have a look at Appendix B: Using the Luke Analyzer Tool). Luke has moved its location a lot of times but when searching for a version that supports the latest Lucene APIs there is this project maintained by Dmitry Kan on GitHub with the following releases ready for download. We simply just need to download the desired version and extract the runnable jar somewhere. 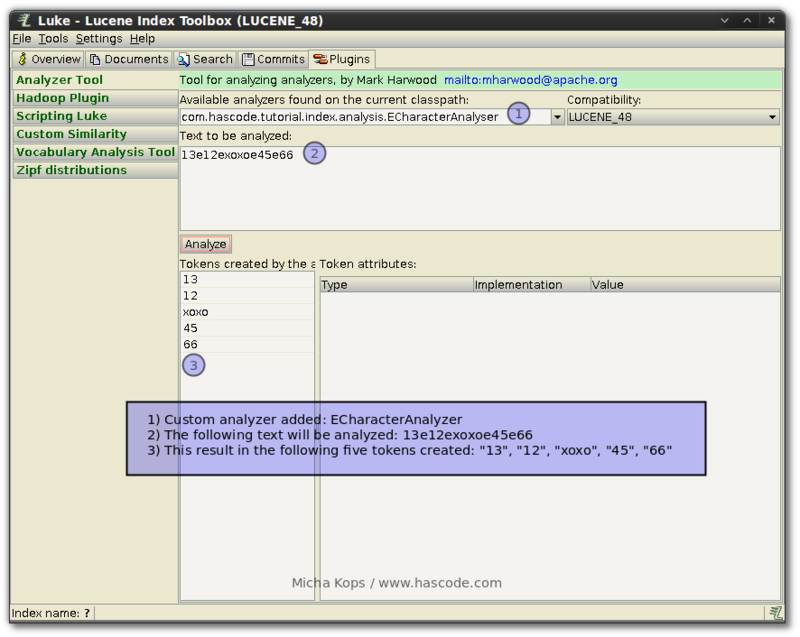 The Analyzer plug-in for Luke by Mark Harwood allows us analyze a given text with different integrated analyzers to see which tokens are generated by each specific analyzer. A short example: We want to store the string “kitty@cat.com” in the index analyzed (yes there are other ways – it’s just an example) and we want to search for the complete term afterwards e.g. to implement a specialized e-mail search or something like that. As we have written a custom analyzer we might want to analyze how some text is tokenized by this analyzer, again using Luke and the analyzer tool. This entry was posted on Sunday, July 6th, 2014 at 3:39 pm	and is filed under Java. You can follow any responses to this entry through the RSS 2.0 feed. You can skip to the end and leave a response. Pinging is currently not allowed.